Play Mean or Play Nice: How Did NPR Manage News Corp. Coverage? : NPR Public Editor For part two of our Murdoch coverage analysis, here's a peek inside the newsroom from one of NPR's editors. Deputy Managing Editor Stuart Seidel describes how the newsroom coordinated the unfolding of the News Corp. scandal. News Corp. CEO Rupert Murdoch delivers a keynote address at the National Summit on Education Reform on October 14, 2011. Did NPR's editors order that the coverage of the scandals surrounding Rupert Murdoch's News Corp. have a critical tone? Or pound at negative angles? Conservative editorialists in two of Murdoch's units, Fox News and The Wall Street Journal, have been harsh critics of NPR, so we all might be forgiven for imagining that the memo went out to be tough, if not vindictive, in the reporting. Or conversely, perhaps an order went out to take the high road, in part to show News Corp. what class is. I am purposefully not part of newsroom discussions so that I can judge what we all hear on air or read online. Discussions are lively. Everybody is paying close attention to the News Corp story. People from various desks have their particular pieces of the story: Business, Media, Foreign. The Science Desk helped with understanding phone hacking. But the desk's editors have been a vital part of the daily discussion. Their understanding of American politics provides great insight into the machinations of British politics. There are daily meetings, of course, with editors or producers from each desk and every show. Those meetings are often quick and perfunctory. People are busy and, if there's not much news happening, we gather to make sure everybody is rowing together — and then get back to respective desk or shows. A couple or few times a week – it depends upon what's happening in the news – some discussion picks up about something. 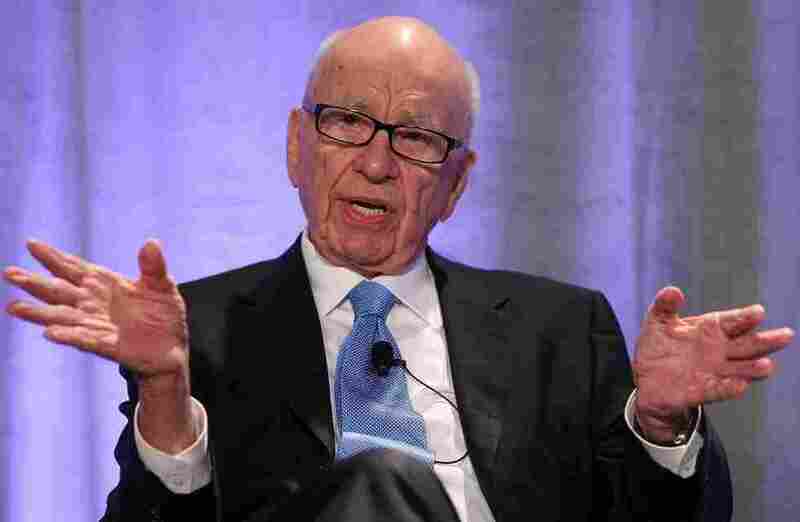 In recent weeks, with the News Corp. story, the two days that caught the most attention were the day of the hearings with the Murdochs and Rebekah Brooks and the day of parliamentary debate. Public performances before cameras and microphones — cabinet appointees, Supreme Court nominees, commanding generals, visiting ambassadors; such major celebrities for a public radio audience — are a favorite. They provide the opportunity to rate, second guess and compare with similar performances. The same things catch the attention of the editors and producers around the table as attract the interest of most of our audience. The pie incident with Rupert Murdoch during his hearing at Whitehall probably got the most idle chatter, of course, and the conversation quickly turned to a friendly competition over who could remember various pie incidents in history. The story that aired that day inevitably mentioned the pie guy but the bulk and substance of the story was hearing what the Murdochs and Brooks had to say. The parliamentary debate also received considerable conversation. Cameron's stamina and debating talents were admired and pointed to as reason for his success as a British politician – and perhaps the one thing that could save him from a loss of party confidence. Comparisons with the American Congress were inevitable. The consensus held that few American politicians could have matched Cameron – and that conversation then wandered into recalling past political oratorical performances. Daniel Webster's name got mentioned. Henry Clay. Thomas Hart Benton. Of course, none of us ever actually heard those guys, but the reputation of the era was observed. They're NPR editors and producers. What do you expect? Much more serious discussions – often they're not protracted or necessarily profound – at meetings center on how to treat the story from day to day. Then there are one-on-one discussions between desk and show editors and producers about the broad content of the planned pieces. Specifics are usually sorted out between the correspondent and his/her editor. Sometimes there's some broader conversation about the specific content of a news story, but that's the exception, not the rule. There's daily discussion about which aspect of a story will be handled by one or another desk. Many things influence decisions. For journalistic reasons — and for practical reasons — NPR's Media Correspondent David Folkenflik left his base in New York to fly to London to cover the story. That made sense since the story was centered at the time on one of the most important media companies in the world. Also, as a practical matter, London Correspondent Phil Reeves was north of the Arctic Circle on a reporting trip for a series planned for later in the summer. By coincidence, at about the time the News Corp story shifted toward enveloping all of Britain's political world, David needed to get back to New York and Phil got back to London. They've both been full on the story since. Daily conversations between desk editors sorts out who will take what angle of the story. There are inevitable overlaps. There's almost always some healthy internal competitiveness. It gets sorted out, inevitably along logical lines given one or another correspondent's experience, location and available time. Ultimately, on a story like this, there's plenty for everybody involved. And more.